Maximising profits and minimising inputs is what fertiliser solutions supplier Advanced Nutrients strives to achieve for their customers. The company supplies granulated and liquid fertiliser solutions across all crops including products specifically suited to sugar cane. This range includes their patented carbon coated fertilisers headed by Black Urea®, a range of granulated blend and the popular liquid solution, Bang P™. 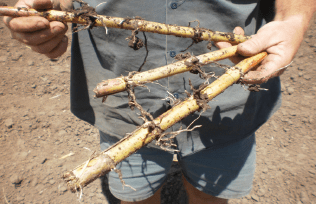 Bundaberg district cane grower, Brad Penny said he had nothing to lose by moving to liquids but everything to gain – applying Bang P.
“We had never tried it before so I guess I was skeptical to start off with,” he said. “I liked the idea that liquids wouldn’t burn the plants and the fact it worked out cheaper was an added bonus.”The whole process was easy because we applied it at the same time we were spraying for grubs so we were able to do two jobs in one application so it cuts down on work you have to do on a farm. “The results spoke for themselves – our figures showed a return of $23 for every dollar spent on Bang P – adding to that we got an extra 12.3 tonnes per hectare from the sugar cane crop. Mr Salmon said he was encouraged by growers who were willing to change their farming practices to improve the quality and quantity of their crops. The company, who are in their 12th year of operation, have invested years of research both in Australia and overseas in Black Urea® and Black DAP™ which has culminated in superior products to boost plant growth by improving nitrogen and phosphorus efficiently, saving growers thousands on fertiliser costs by reducing leaching and volatilisation. The sugar blends incorporate the company’s own biostimulant, carbon based coated Black Urea® and Black DAP™ in place of standard urea and DAP. For more information call Advanced Nutrients on free call 1800 244 009. Bang P™ is 4-5 time more efficient than granular phosphorus. Available in bulk, 1040L, 208 L and 20L. Bang P™ is high analysis and has added organics for greater nutrient uptake and a soil penetrant for greater dispersion around the root zone. Bang P™ is easy to use and does not require special application equipment, simply add in planter bath or dribbled into soil. Can also be applied via boom spray, aerial, fertigation or overhead irrigation. Bang P™ can be tank mixed with most common insecticides and fungicides but always refer to manufacturer’s instructions. Bang P™ is an ideal product for all nutrition programs to give an excellent boost to growth, root development, colour and overall plant health. 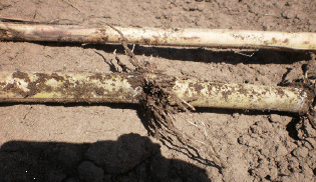 Treated and untreated cane at 14 day growth stage. Bang P™ at 15 L/ha in planter mix.